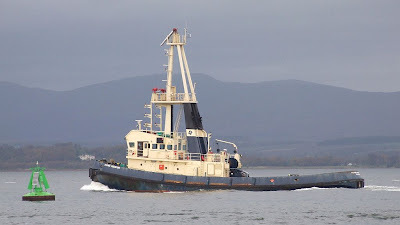 Seen passing her birthplace, the tug FLYING PHANTOM was launched at Ferguson Brothers shipyard in 1981, for the Clyde Shipping Company. By the mid 1990s, the company had been taken over by Cory Towage, and in 1997, FLYING PHANTOM was given a major refit which included the installation of a retractable Aquamaster thruster forward. This, together with her two Ruston 6RKCM main engines driving a single screw via a gearbox, give her a bollard pull in excess of 40 tons. In 2001, her owners became part of the Svitzer group of companies. She is 37.95 metres in length, and is 347 gross tons. Her two firefighting pumps can each deliver up to 1600 gallons per hour, and her mast structure includes a fire monitor 70 feet high.